If you wanted to pick a place that exemplified the term “tropical paradise” you couldn’t go wrong with Hamilton Island. Located in the heart of the Great Barrier Reef, off the coast of Queensland, Australia, this small island of 1,200 inhabitants boasts palm-lined beaches and picturesque coves, azure waters and all-year-round mild weather, as well as first class amenities such as a golf course, a yacht club and an airport. 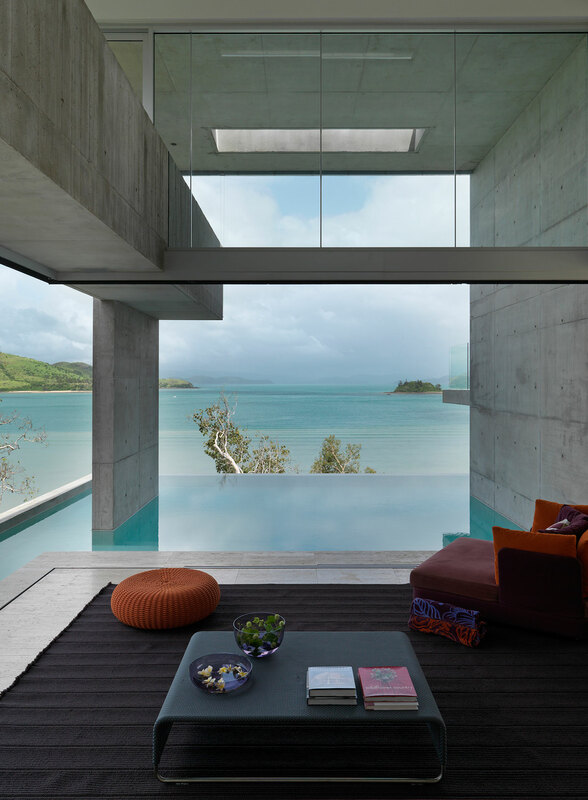 Designed by Australian practice Renato d'Ettorre Architects, Solis House takes full advantage of the island’s scenic environment and lush vegetation to create a house of minimal elegance and spectacular views that is both permeable to its natural surroundings and reflective of their tranquillity. 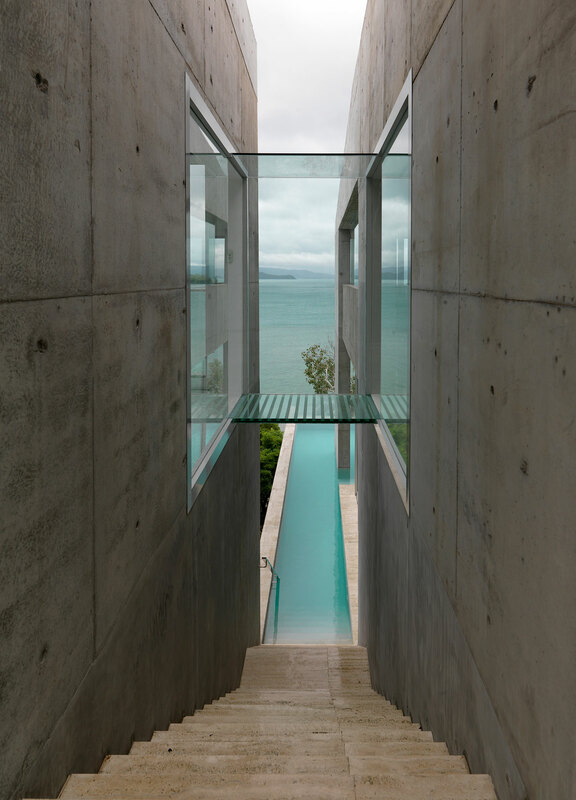 Built over three inter-locking levels, the property is approached from higher ground, down a steep driveway resulting in first impressions of a house that actually hovers above the sea below. The upper levels house the communal living areas and, typically, for houses in the tropics, blur the distinction between the indoors and outdoors through a sequence of unfolding, semi-enclosed, airy terraces—only a small part of which can be completely closed off during extreme weather—that capture cooling breezes and allow for natural cross ventilation. 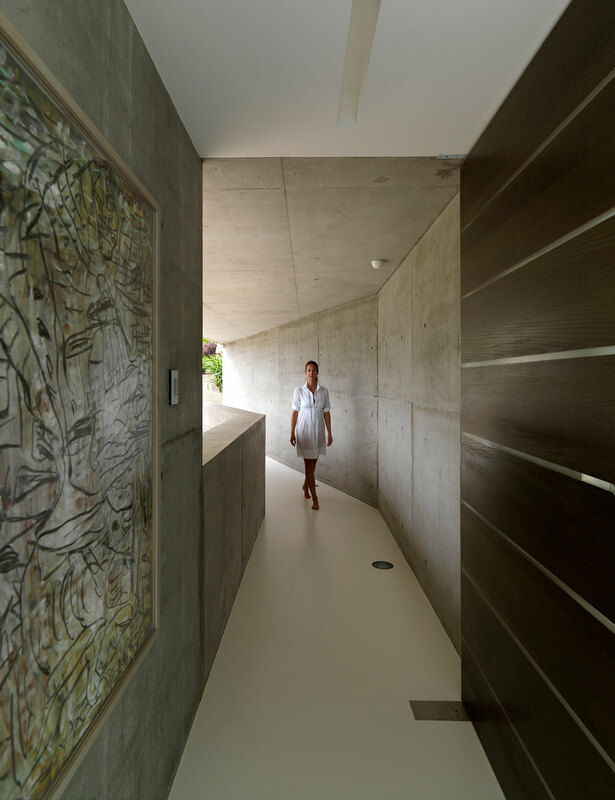 While the private quarters on the lower levels are more cavernous, with carefully framed ocean views dictating the layout, they too blur the boundaries between exterior and interior, seamlessly integrating balconies and terraces into bathrooms and bedrooms. 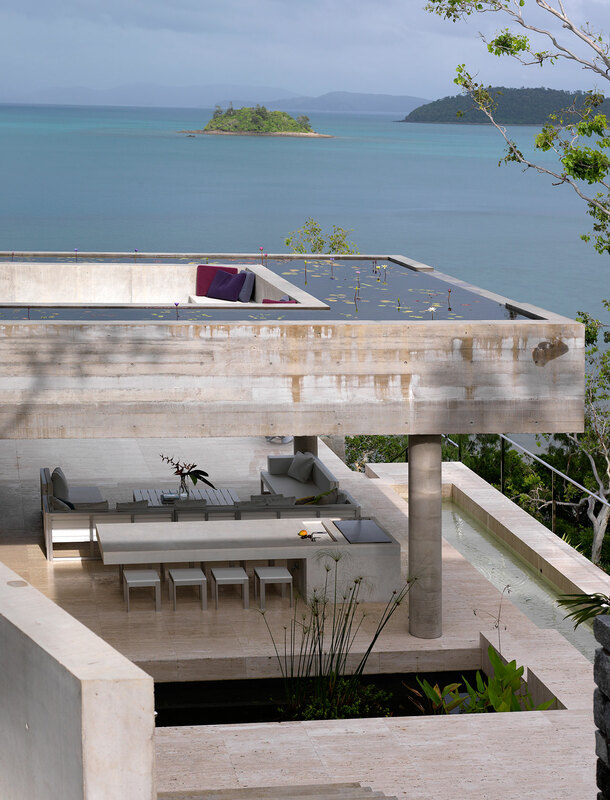 Approaching the property down a steep alley, the house gives the impression that actually hovers above the sea below. 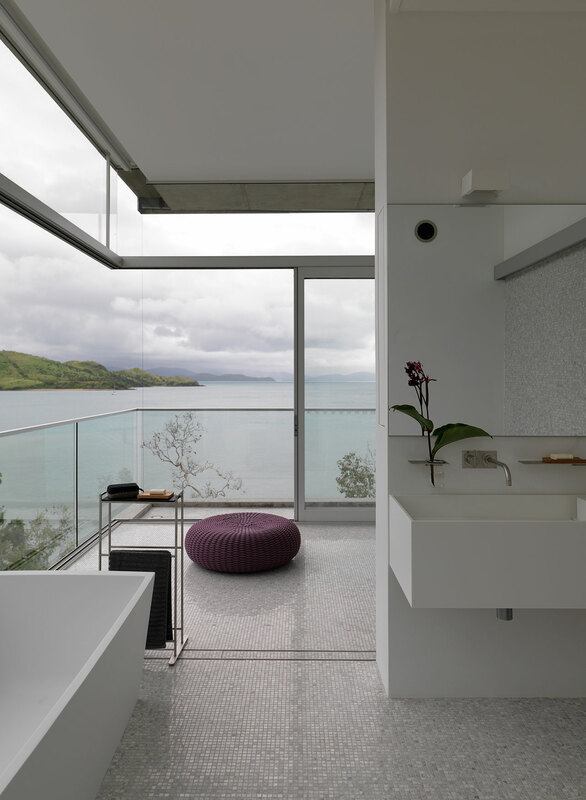 The architects have taken a minimal approach to the interior design both to establish a sense of purity and tranquility and avoid any superfluous elements that could distract from the beauty of the natural backdrop. 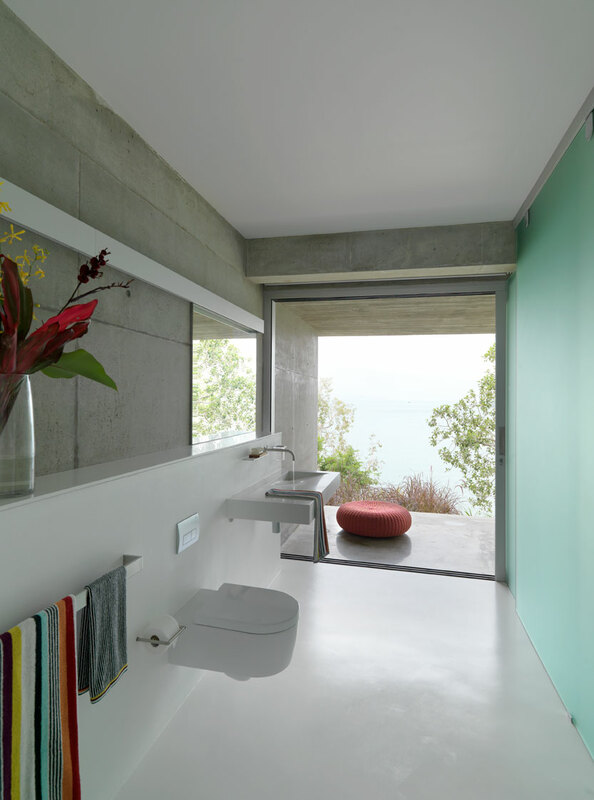 An emphasis has been given to built-in furniture, such as concrete seating that only require cushions, and to a subtle color palette of natural grey concrete, white walls and off-white travertine floors chosen as a neutral background to the sub-tropical setting. 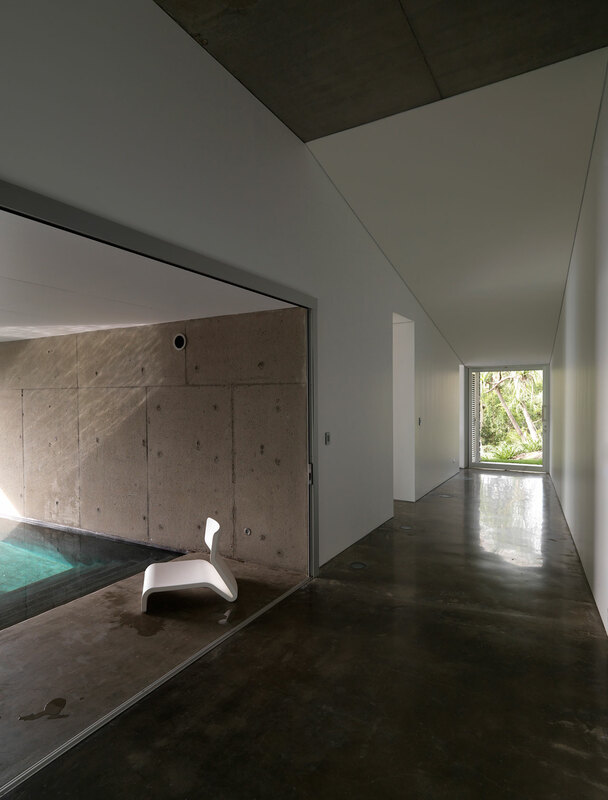 The selection of materials was also kept to a minimum with concrete and limestone being predominant, chosen for their low maintenance, a prerequisite in a hot and humid climate with seasonal heavy rains, and their thermal properties which are ideal for natural cooling. Their tactile qualities was also a primary consideration with special care given to concrete surfaces: with those on the upper levels having been imprinted with a timber grain, evoking the surrounding vegetation, while those on the lower levels have been kept plain in order to correspond to the granite rock outcrops that the island. 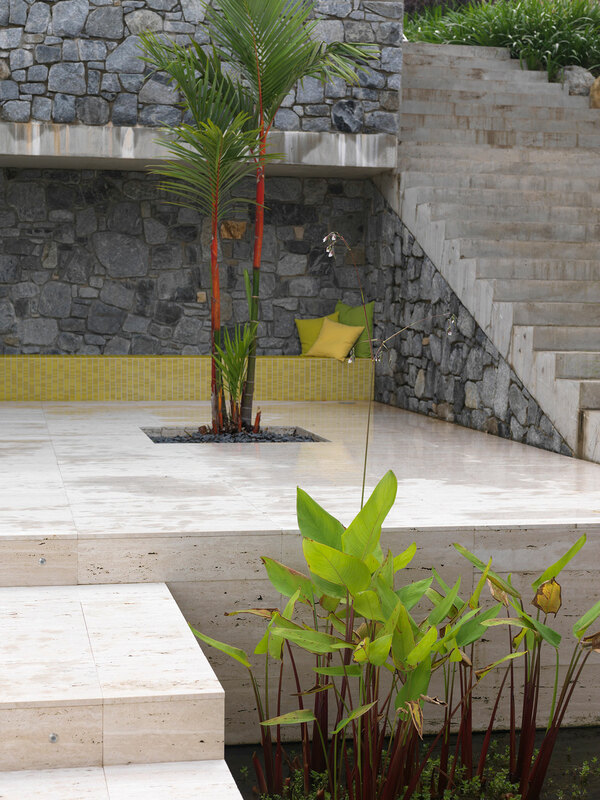 The natural landscape is further evoked by several water features throughout in the form of reflection and lily ponds, trickling waterfalls and swimming pools, which promote a sense of serenity as well as function as cooling elements. 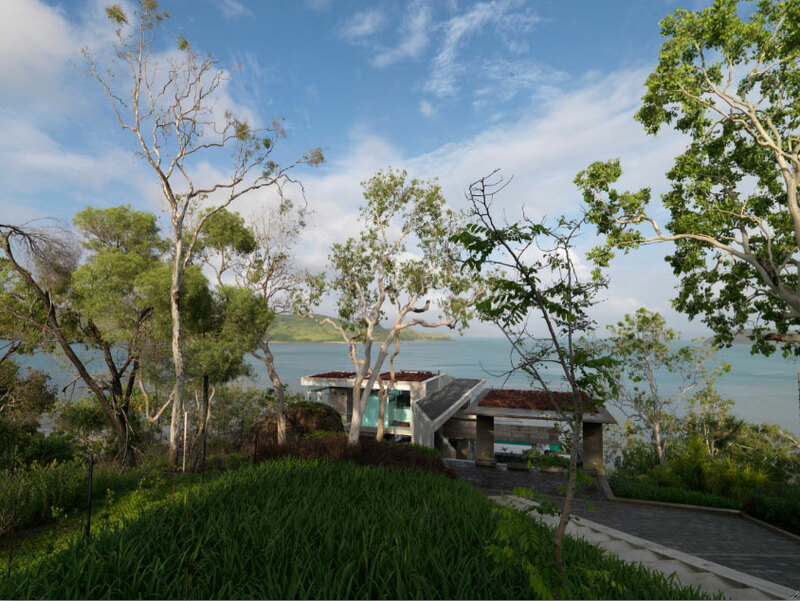 Additional passive climate controls such as solar shading, green roofs and rain water collection further highlight how embracing nature is integral to tropical living.